The rage of American dinner parties in the 1950s and early 1960s, crêpes suzette are almost as easy to make as a box cake mix, especially if you make the crêpes early in the day and assemble the dessert right before serving. 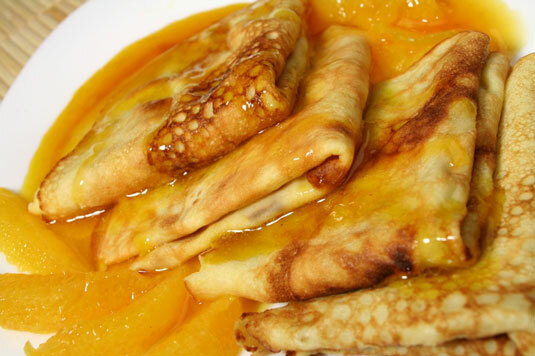 Be forewarned: These orange-flavored, buttery crêpes are addicting! Prepare the sweet French pancake batter, folding the crêpes in quarters as you remove them from the pan. Keep them covered on a large plate with a clean kitchen towel. Fold the crêpes in quarters. Melt 4 tablespoons of the butter in a large skillet over medium heat. Add 1⁄4 cup of the sugar and stir until melted. Add 1 tablespoon of the orange zest and 1⁄2 cup of the orange juice. Stir well and bring to a simmer. Add half the folded crêpes, turning gently to coat with the sauce. Finish the sauce by adding 2 tablespoons of the Grand Marnier, allowing it to warm for a few seconds. Remove from the heat. Light a match and, holding the match in one hand, grab the pan with your other hand and slightly tilt pan away from you so that the sauce accumulates in that part. Ignite the sauce with a match. Be careful because the flames will rise high as the alcohol burns off! Place the pan on a flat, heatproof surface. When the flames die down, serve the crêpes, spooning the sauce over them. Even though you use a nonstick pan to make the crêpes, you may need to occasionally brush the bottom and sides of the pan with a little butter so that the crêpes don’t stick. Combine the milk, water, eggs, sugar, orange liqueur and salt in a blender jar and blend until smooth. Add the flour and butter and blend for 1 minute or until smooth. Pour into a large bowl, cover, and refrigerate overnight. 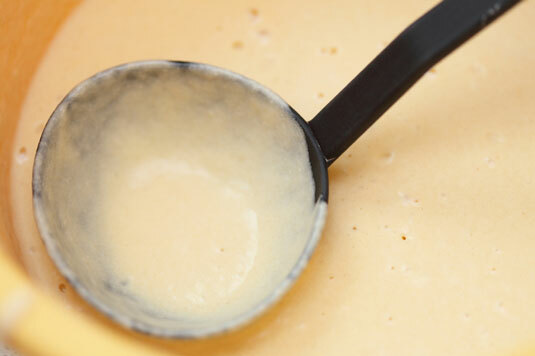 Remove the batter from the refrigerator and check the consistency; it should be thick, like heavy cream. Heat a nonstick 8-inch crêpe pan or skillet over medium-high heat. Hold the pan with one hand and lift it off the burner. With the other hand, pour 1⁄4 cup of batter in the center of the hot pan and quickly begin to tilt the pan and swirl the batter so that it covers the bottom evenly in a thin layer. Place on the burner and cook for about 1 minute or until the edges begin to brown and the batter seems set on top. Cook for no longer than 30 seconds and remove to a plate. The top or good side of the crêpe should be evenly golden; the other side will be lighter in color and look different. Fill and roll each crêpe, or spread with a favorite filling, stack, and cut into wedges to serve.